These chorizo chili mussels are an easy, one pot meal made in 20 minutes with spicy dried chilis, fennel and chorizo in a chunky tomato broth. Serve with some warm crusty bread for a seafood feast! There’s this tiny biercafe nearby with about 10 tables max, an amazing (yet pricey) craft beer list, one hell of a delicious chicken and waffles dish and weirdly, some of the best moules frites I’ve ever had. *This post is sponsored by the Mussel Industry Council of Prince Edward Island through HireInfluence. I was compensated for this Chorizo Chili Mussels recipe but all content and opinions are my own. 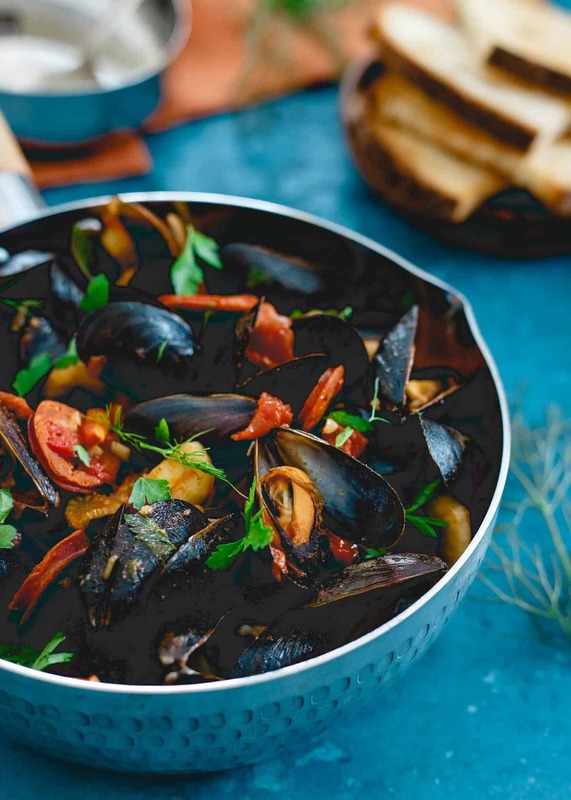 The first time I went, I sat there staring at the menu for far too long trying to decide which variation to go with, it was a toss up between the coconut curry mussels or the Spanish mussels. It felt like choosing between two equal loves of my life. I always say, if I had to pick one kind of cuisine to live off the rest of my life, it’d be Thai. I’m a sucker for creamy coconut dishes with that bright and fresh pop of lemongrass, ginger and cilantro. But then there’s Spanish food, a country I lived in for a short time and grew to love. Passing up chorizo is not an easy decision either. I ended up choosing the Spanish mussels pot that first visit, but I’ve since tried them all. I wouldn’t complain if someone wanted to cook me any of them but I do think the Spanish version is the best. Which is exactly why it needed to be recreated at home in this recipe. I kept all the parts I love about the dish, the chorizo and the spice from from peppers but switched out other things like the Belgian beer for a more hearty and rustic red base by using chunky whole tomatoes. Chorizo lover? Check out this chorizo spinach skillet pizza! The result is a 20 minute, one pot feast in these chorizo chili mussels using fresh PEI mussels. See more one pot meals like this chicken artichoke olive skillet or, this smoky steak potato and pepper skillet. 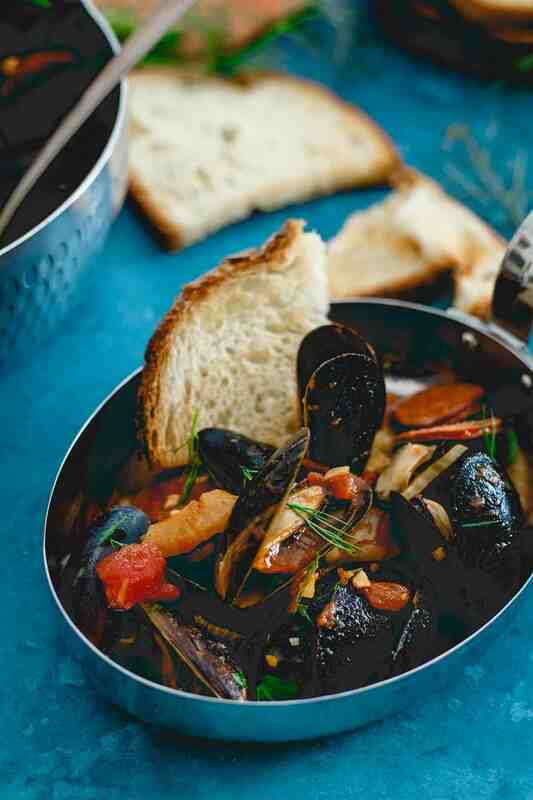 With just 8 ingredients, although you’ll want a nice big crusty loaf of bread to soak up all that amazingness at the bottom of the bowl, I’m hoping this breaks through the misconception that mussels are a difficult dish to make at home because the opposite couldn’t be truer. PEI mussels are healthy, quick, easy and affordable ($5.99 for a 2lb bag! ), basically everything but difficult! There’s actually nothing tricky about cooking them either, a quick scrub and rinse and then into a pot to steam until they open up. The first time you make them at home, you’ll be wondering why you haven’t done it sooner. Guaranteed. There’s definitely a little spice from the chorizo and chilis in this dish but it’s all balanced nicely by the freshness of fennel and fresh parsley. 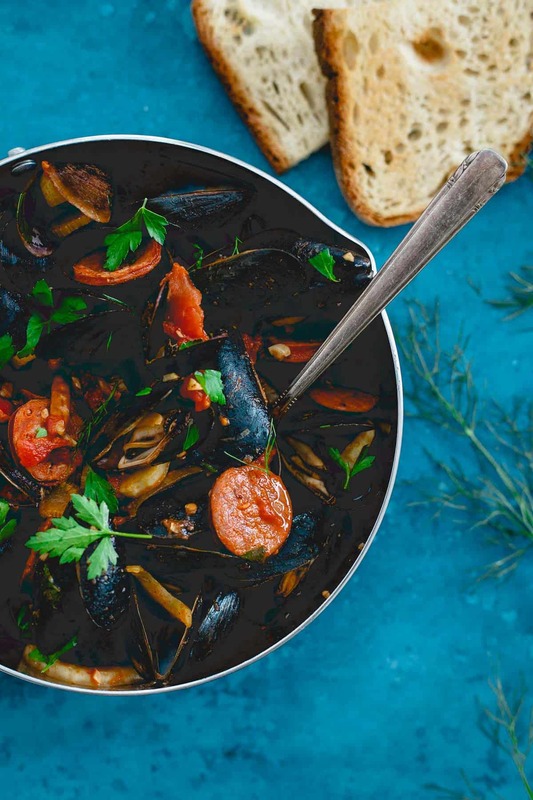 With the heartiness of the chunky whole tomatoes, it’s a mussels pot that can definitely be called an entree instead of an appetizer for those nights when you want something that feels special but doesn’t require the extra effort. 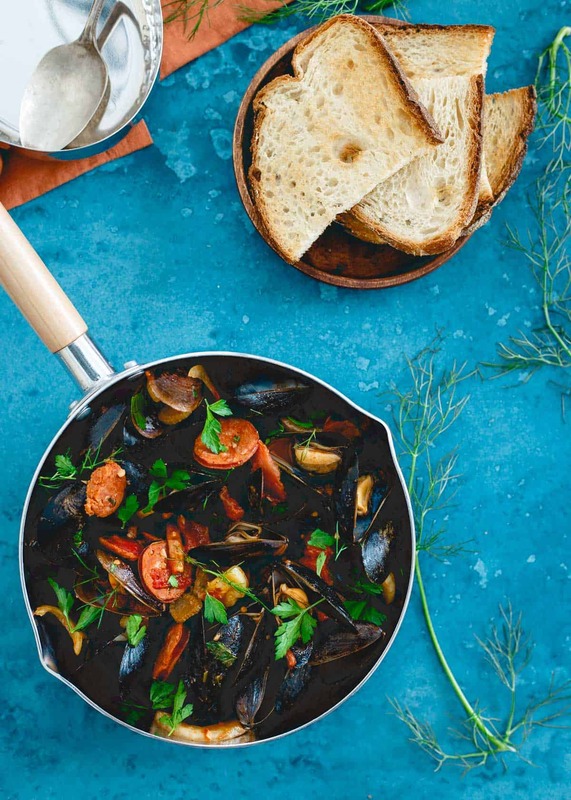 These chorizo chili PEI mussels are an easy, one pot meal made in 20 minutes with spicy dried chilis, fennel and chorizo in a chunky tomato broth. Place the olive oil in a large pot or dutch oven over medium heat. Once hot, add the garlic, fennel and chorizo. Cook until chorizo is browned on both sides. 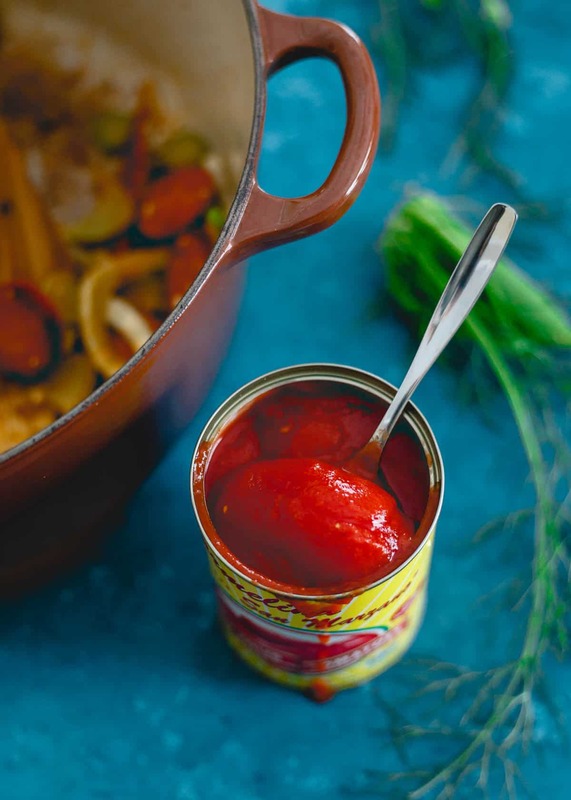 Roughly break up the tomatoes in the can using a sharp knife or scissors. Place the tomatoes and dried chilis in the pot and reduce heat to medium-low. Season with salt and pepper to taste and simmer for about 5 minutes. 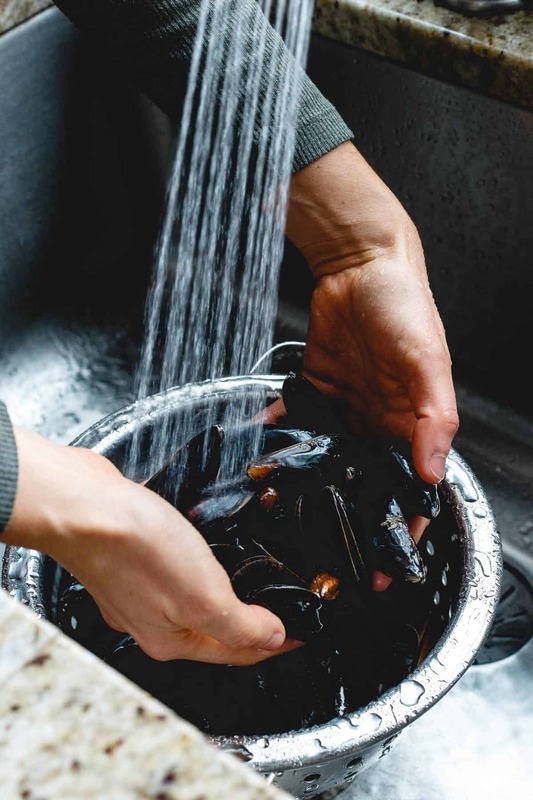 Add the PEI mussels to the pot, toss to combine, place a lid on the pot and let the mussels steam for another 5-7 minutes or until the mussels have opened. Feel free to steam for a few additional minutes if you notice unopened shells. Garnish with parsley and serve with crusty bread. Make sure to discard any mussels that have not opened. Yowza, I love all the flavor going on in this dish. I often use chorizo in my seafood dishes as well, love the pungent kick it lends. Haven’t tried mussels yet, but I love it with clams – which, we have a ton of here on the Eastern Shore of Virginia. Delish! So gorgeous!!! And I’m a huge fan of mussels. Love that you added chorizo to the recipe – such a good idea! We love mussels and you created a masterpiece here! I cannot wait to try this recipe! Stunning and delicious! Mussels is one of our favorites at the beach Gina! Love the chorizo addition! Loving these flavors! sounds incredible! I think it’s time I try mussels! This looks too good to pass up. Muscles are my favorite and they really are so easy to make at home! Can’t wait to try these! Mussels and Chorizo make an excellent pairing! Thanks for sharing!